Vilcabamba to Zumba, Ecuador – overnight bus journey, overly delayed due to landslide blocked roads! Breakfast at Zumba. We hired a taxi at the bus station to drive us to the border with Peru. We also asked the taxi guy to take us to a restaurant that has food, coffee and clean restrooms. I had toast and coffee here. The Zumba bus station was brand new and didnt even have toilets open to the public. The views from Zumba to La Balsa, the border are beautiful! 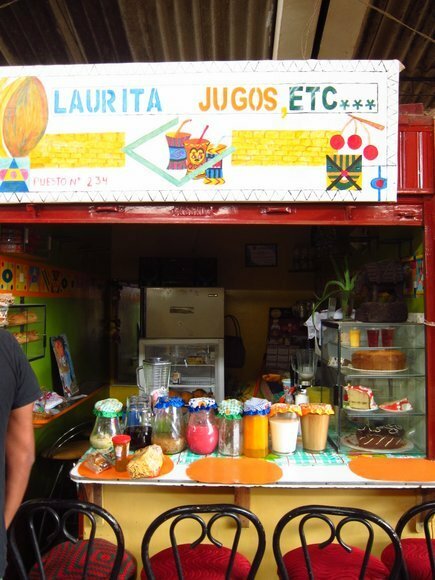 Once we cross the border, we took another collectivo (like a share-auto) to the city of San Ignacio. No food here as well. Another collectivo to Jaen. Jaen is a large city and we spent the night here. We did find one vegetarian restaurant, but it was closed. Unfortunately, I did not note down where it was. From Jaen, it was another collective to Bagua Grande and then another to Pedro Ruiz and then another to Chachapoyas. Phew. 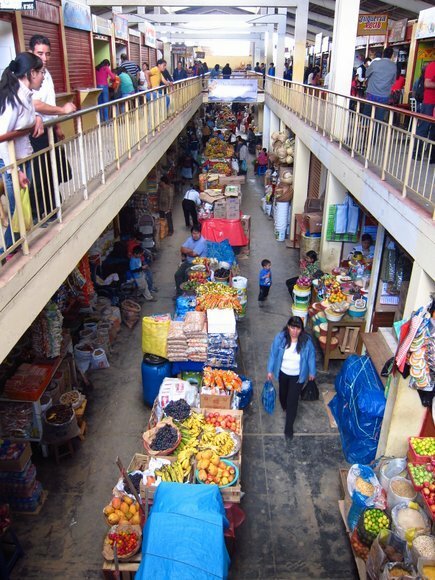 This is the main market in chachapoyas. Its not this small and you can make in a maze as you go from this main corridor. You can find everything here. I often imagined myself living in this small lovely town and coming here on weekends for my fresh produce and grains! So many juice stalls in the market. Do you see the juice with grains? Thats a quinoa drink. Quinoa, sugar, cinnamon, water. Yum! 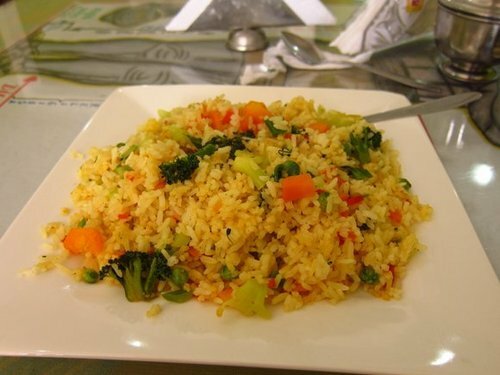 Finally, a hearty vegan mixed vegetable rice dish at the El Eden vegetarian restaurant in Chachapoyas. Restaurants in this part of the world close early, open late and take breaks between lunch and dinner. So make sure you find out when they are open as you pass by and decide to come later for a meal. You might just find them closed. They have a set menu for lunch for about 4 soles which usually includes a drink, a salad from the salad bar, a soup and a main course plate. Thats less than $2! A little map that I drew that indicates two vegetarian restaurants. 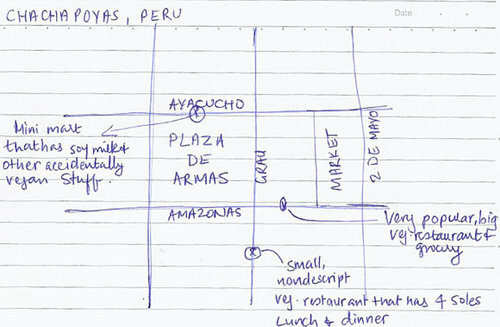 There is another one that I forgot to mark here ..you go right on Ayacucho away from the plaza towards the market and there is a restaurant on your left hand side. It was closed and didnt seem operational, so I am not sure if its still around. 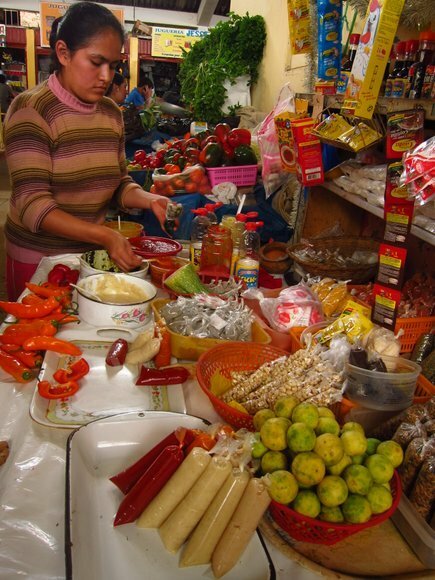 El Eden is on Amazonas ave, its the very popular and big veg place. You cannot miss it. But the one you should check out is the one thats hard to find. Go here because they have a set menu for lunch and dinner and very unpretentious. Its a house converted into a small restaurant. They have a small stall selling health food. And the best all, they seem to be open on most days. This is on Grau – keep walking down on Grau away from the plaza. Restaurant is on the left hand side. 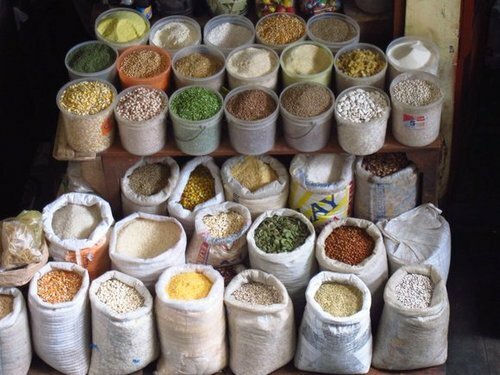 In the market, you’ll find stalls where the vendors are mixing various spice pastes for you to take home. 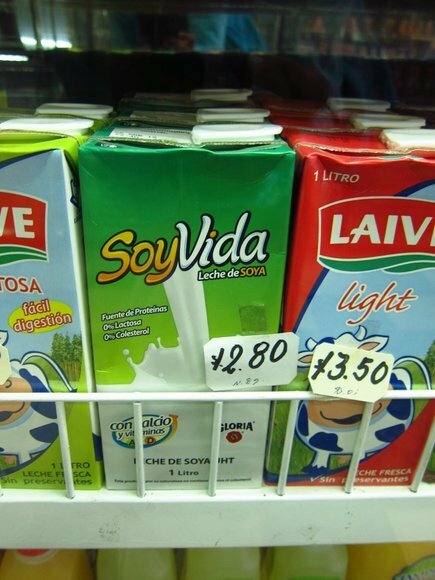 This is common even in Bolivia. Look at the little packets she has made here for sale. Each cost about 1.5 soles. Pick this up, some veggies and rice and cook it all in a pot and you’re good for dinner. 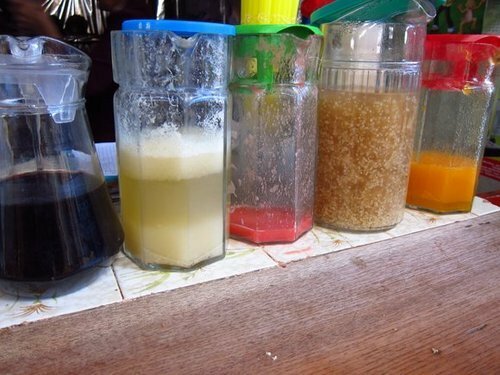 So many juice stalls selling all sorts of fruit and grain juices. Yes! Grain juices. Made with quinoa. Yum!